I spent my Sunday at my first pen show: The New England Pen Show in Boston. It was a great time and well worth the drive. 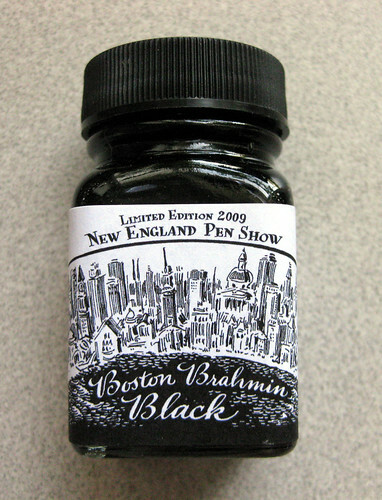 The first 200 attendees got this ink for FREE with their admission: Noodler's Boston Brahmin Black, the 2009 New England Pen Show exclusive color. I will post ink scans SOON (later today or tomorrow, I promise!) 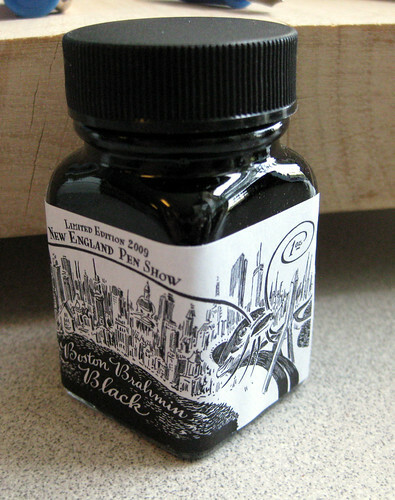 - I took photos of this ink along with a whole bunch of other Noodler's inks that I got to test at the show - but here's the bottle for a teaser. I love the bottle - just not a fan of black ink. I like COLOR!! I hear you, Okami - I also prefer color. I have a few nice blacks I like, but this isn't one of 'em. But hey, it came free and I love the bottle. Just wait 'til I post photos of my new Noodler's V-Mail series Midway Blue, though! THAT's some color. I would buy three 1oz bottles instead of one 3oz bottle. Now where is Ben? 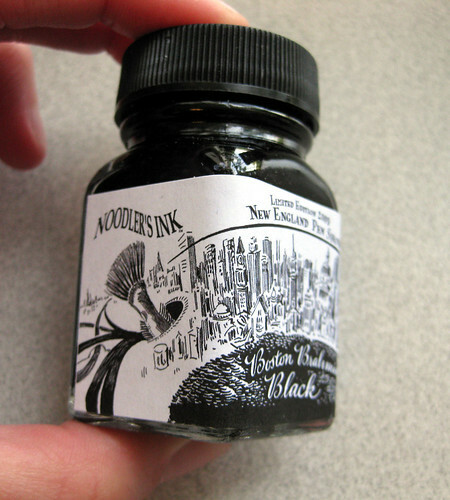 This ink was only available in a 1oz bottle, as far as I know.